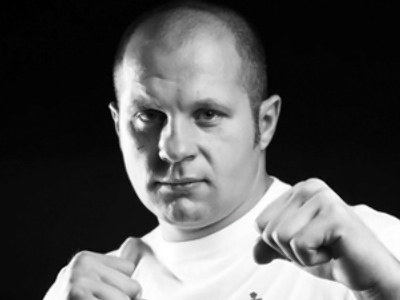 For many sports fans across the world Fedor Emelianenko is a living legend. He's the undefeated reigning mixed martial arts champion. But "The Last Emperor", as Emelianenko is known, says he's no superman. Fedor Emelianenko has dominated the ring for years, but this week saw his first face to face meeting with fans in New York City. Crowded in a hot and humid room, hundreds were tripping over each other to capture a moment with their hero. “It's absolutely surreal. I felt this is a dream,” a fan of Emelianenko said. “Some fighters are just good fighters but he is a true athlete,” said another. The 32-year-old Russian fighter has become the cream of the crop in this close combat sport, with a 26-win streak. Becoming a punching target for the 233-pound champ is an opportunity trainer Brandon Levi welcomed. “He's just very calm and never seems to get flustered. He's got great technique and pretty much everything,” says Emelianenko’s trainer. Mixed martial arts is often criticized as dark and dangerous, because basically nearly everything except biting is allowed. Ironically it’s Fedor’s even temperament that fans praise first. “He is just humble and sees his opponent as a person, as a friend and not an enemy,” says one of his fans. Outside the ring, Emelianenko is reserved and simple. A self described avid reader, he's often modest about the accolades and says he doesn’t consider himself to be the ultimate in the sport. “There are many fighters that I haven't fought with yet, and sooner or later there will be one who will replace me,” the World Alliance of Mixed Martial Arts heavyweight champion told RT. The world champion may rule the ring. But at home in St Petersburg, he’s dominated by women. Before reaching international success, the father of two was a professional judo and sambo [Russian martial art style] competitor in Russia. Now Fedor Emelianko is training three to five hours a day, preparing to take on Brett Rogers in November. “I feel well. Everything is OK. I'm preparing for [my] next fights at home. I feel OK and I think this is going to be the next spin of my career," Emelianenko says. A career that seems to be only scratching the surface of success.